When Great Uncle Abram told us that his god had instructed him to leave Haran and travel to who knows where, we, his extended family, were appalled. The wilderness ‘out there’ was a dangerous place, and nobody in their right mind spent more time than necessary travelling through it. But it seemed that this god had told Father Abram (we called him that because he was the patriarch of the family) to pack up and go with no real final destination in mind. However, as they say, there is safety in numbers, and numbers were what Father Abram had – kinfolk (of which I was one), flocks and herds, servants, and his wife, Sarai. I, Joel, was fifteen at the time, and not at all trusting in this invisible god. And so I took along one of our house gods, tucked in my saddle bag with my other belongings. I knew that a god’s influence was local, and one could not assume that they would be ‘out there’ to save us. So it was safer to carry my god with me. Over the next 25 years we travelled back and forth across the desert, down to Egypt and up again, battling with kings and dealing with the day to day care of animals and people. Oh yes, life was an adventure. And all the while Abram would rise early and pray to his invisible god, sometimes even building an altar to him. I, meanwhile, took mine out at night and prayed for the kind of things a young man prays for – wealth, a good wife, lots of sons – some of which came to pass. I did find a wife and had three sons, as well as two daughters, so life was full and I could thank my god for it. Father Abram, on the other hand, had no son and heir. So much for his God. Then one day Abram announced that his god had told him that his name was now to be changed to Abraham, and Sarai was to be called Sarah. It seemed that I was a sort of favourite of Father Abram, and could talk with him reasonably freely, so it was after this announcement that I asked him why his god had told him to change their names. He said that he had promised him he would have offspring ‘as numerous as the grains of sand of the earth and the stars in the sky,’ and their new names reflected that fruitfulness. I almost laughed out loud, but stopped myself in time. It would have been most disrespectful. What a ridiculous idea! He and Great Aunt Sarah were in their nineties at the time, and Sarah was barren. He had one son, Ishmael, by Sarah’s maid, Hagar, but no true heir to his or Sarah’s name. Now I was absolutely sure that his god wasn’t a patch on mine. We eventually settled by the Oaks of Mamre, and it was there that a peculiar incident occurred. It was mid afternoon and I was on my way from tending the livestock to Father Abraham’s tent, wanting to ask his advice about something, when these three men appeared. There were no beasts of burden in sight, so they must have walked, but I hadn’t seen them coming. Their appearance was unremarkable, except that they had an air of quiet authority seldom found in men. Father Abraham must have seen it too, because when he came out of his tent he bowed low to the ground to greet them. He then offered them the traditional hospitality of washing their feet and preparing a meal. I was sent to instruct the servants to choose a fat calf to prepare for the feast. Sarah and her maidservants, meanwhile, set about baking cakes to set before them. While Father Abraham and the men conversed, I noticed Sarah behind the tent opening eavesdropping. ‘Typical nosey woman.’ I thought. ‘Always wanting to know what’s going on.’ But then I realised that I myself was hanging around in the background to do just that. “In the tent.” Abraham replied. And Sarah did what I was too polite to do – she laughed. Sarah denied her laughter, because she was afraid, and he said, “Oh yes, you did laugh.” But it was a gentle reproof, as though he wanted to allay her fear. At that point I left them for my own tent, but kept an eye on them from a distance. The three men eventually left, walking out towards Sodom. But then they just seemed to disappear. Mind you, it could have been a trick of the evening light. Father Abraham stayed where he was however, praying to his god, pleading with him about something. I wondered whether this invisible god who made such extravagant promises was listening, and that night took my god out of my bag and thanked him that he wasn’t like that. With him I was safe, never having to deal with such nonsense. It was some time later that I had to eat my words. Sarah announced that she was pregnant. The women in the camp threw a party like nothing you have ever seen. There was feasting, music, singing and dancing around the fire well into the night. All my certainties about my god were being eroded. I crept up beside Father Abraham with my head burning with questions. I went back to my tent and to my god and thought hard about what Father Abraham said. A few days later, on a foray into the desert, I ‘lost’ my little god, leaving it to be buried by the sand whipped up by fierce desert storms. And then I began to rise early to be with Father Abraham and learn to pray to this invisible, all-present God, and, to my surprise, hear him speaking to me. Great Aunt Sarah did have her baby, whom they appropriately named Isaac – ‘he who laughs’ – and I had the privilege of holding him soon after he was born. And our laughter, which had once been a shameful breach of etiquette, now joined with Isaac’s to become the laughter of deep joy and thanksgiving. 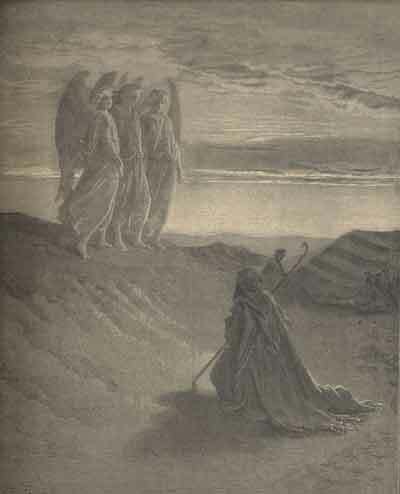 * The illustration at the top of this page is from ‘The Dore Bible Gallery’ by Anonymous and illustrated by Gustave Dore.